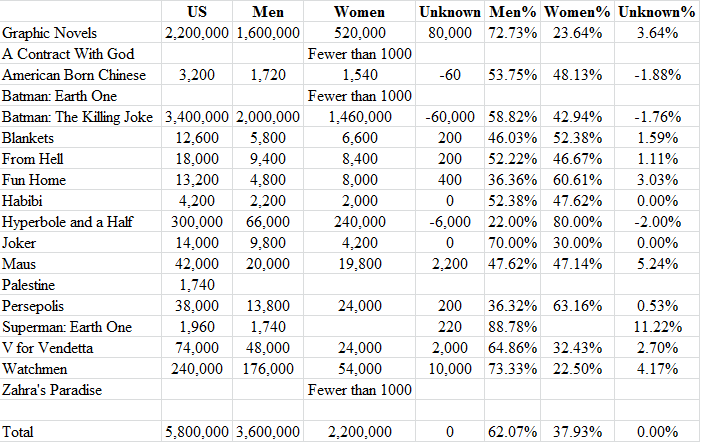 My last post concerning the Facebook demographics of those who “like” comic terms caused a bit of a stir. The comments section was filled with lots of back and worth, and lots of misunderstanding what the point of it all was. But, in those comments, one bit inspired me to dig a bit into specific titles. >>>Would be awfully nice if those 12 million female comic fans would buy a book once or twice too. Oh you mean like this? The chart that shows Fun Home, Persepolis and Hyperbole and a Half consistently selling graphic novels? And books like Smile and Dork Diaries best sellers in the kids arena? But that got me wondering, how does gender break down for some of the more popular “indie” graphic novels versus mainstream graphic novels vs the average? And it’s clear, there’s a difference. Taking 17 various graphic novels (and if folks add suggestions in comments, I’ll be happy to add upon this) I looked at men and women who were fans in the United States. I tried to stick to actual graphic novels, or books that have been long out of print and thus a complete graphic novel is how it’s now consumed. The generic terms “graphic novel(s)” was dominated by men as far as likes. They made up a massive 72.73%. But, when you looked at individual books, there was a clear difference. Out of the 17 graphic novels, men were the majority in a landslide (over 15 percentage points more) for 5, all published by DC Comics. 3 books men were the majority, by the difference was less than 15 percentage points (about 5), all are from smaller publishers. For 1 graphic novel, the percentage of women and men is almost even. Women are the majority, but less than 15 percentage points, for 1 book. And women are the majority in a landslide for 3 graphic novels. For 4 books, the amount of fans was too small to break out individually, though they contributed to the overall total. When you mix the generic graphic novel terms with the books themselves, the percentage of men and women breaks down to 62.07% male versus 37.93% female. Gender is near even, or women are the majority for the graphic novels published by indie or small press publishers. DC Comics’ contributions to the list it turns out are “liked” overwhelmingly by men. One has to wonder if DC or Marvel were to publish graphic novels like Fun Home or Persepolis, how that might shake out demographic wise. In other words, how much does who the publisher is weigh in on who may like the material versus the material itself driving the likes. It also makes you wonder how having data like this would help publishers, especially small ones, spend their marketing dollars better, focusing on more targeted audiences. As well, this again shows, comics and graphic novels aren’t the domain of just men anymore. Below is the full breakdown of the graphic novels looked at (and again, post your suggestions of what else to look at in the comments). For those with fewer than 1000 likes returned, gender was not able to be assessed. The negative amounts are due to Facebook not always returning results to the single digit, which forces some rounding of results. And is anyone surprised the classic A Contract With God has so few likes? Talk about tragedy! Previous Previous post: What’s a Spam Trap?